Find this beer and more at Full Throttle Bottles in Georgetown! Intro: You can call the style Cascadian Dark Ale (C.D.A.) as Deschutes does, or call it a Black IPA like many other breweries. I’ll leave that argument to others. Whatever you call it, the style has quickly become one my favorites as it offers the hop flavors I love so much along with a more complex dark malt base than your typical pale ale. I think the first example of the style that I personally remember trying was the Laughing Dog Dogzilla, and I’ve been hooked ever since. These days, a visit to any beer festival in the NW reveals quite a few examples of the style (at least 5 at the upcoming WA Brewers Festival). 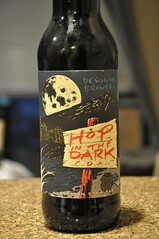 The Hop in the Dark was quite popular when launched last year, and it makes a return appearance this month. Description: Pours a very dark brown, but not quite black with big head. Big aroma of citrus pops out of the glass along with some sweet malt. Definitely a hint of things to come. Taste is a mix of coffee and dark roasted malts, along with a bit of citrus and a strong finishing bitterness. The hops shine in the aroma, but the malt leads in the taste. Deschutes does a fantastic job of bringing this beer together, and it’s one of the best examples of the style I’ve had the pleasure of drinking. Very sessionable. With the various examples of the style I’ve tried over the past year, Hop in the Dark still stands out from the rest. Can an IPA be black? Semantics aside, this noir version has subtle coffee undertones born of a blend of oats with dark, Munich and crystal malts. What emerges is something deeper, less orthodox, and all its own. After 22 trial runs in our Bend and Portland pubs, we got it right. This was the first C.D.A I sampled and it is a deep dark beer. It was bigger then I expected but now having had many of the style it is one I really enjoy coming back to. OK. So the thing here is that CDA or BIPA — should probably be called an India Black Ale (but I digress) — is a style that is not defined nearly as clearly as I would like. I find the profile varies from a hoppy porter (not what I like) to a black ale overloaded with hops to counter-act the malt character (I prefer this). Hop In the Dark is more of a hoppy porter. Just give me a porter, please. Best example of style in my opinion is Stone’s Sublimely Self-Righteous. That is a true India Black Ale!! !